Bass-baritone Donovan Singletary made a great first impression on those who saw Porgy and Bess this summer. 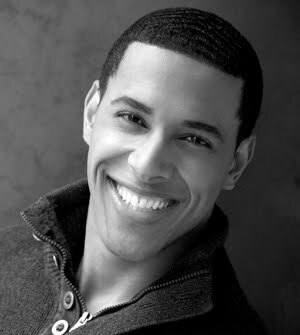 In that production, the Florida native played Jake; now he's back as Zuniga in Carmen. Today, we chat with him about the challenges of an opera with so much spoken dialogue, how he transitioned from pop to opera, and which Carmen character is his favorite. 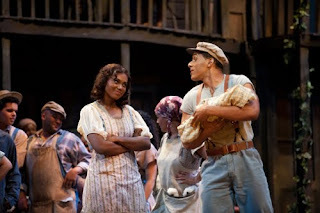 Seattle audiences saw you this summer as Jake in Porgy and Bess. How have you spent your time between that production and this one? Did you go back home or stick around Seattle? No, I had to go back home. I live in New York, in Manhattan. I went back, took care of some other business, fixed up my apartment, worked on Carmen, and now I’m back here! But I had to go back because I always miss New York when I’m away longer than two weeks. December will make it five years that I’ve been there. I moved there two weeks after I graduated from college. You moved to New York to join the Metropolitan Opera’s Young Artists Program. Can you remind us how you got started opera, and how you arrived at the Met? Well, I actually started out singing pop music, and then I wanted to do Broadway, but I didn’t really know what Broadway was. I didn’t realize Broadway was a chain of theaters, I thought it was one huge theater they called “Broadway.” This was me being naïve, coming from a small town in Florida. But eventually, when I got into opera, I wanted to get the best training possible, and I knew that would be at the Met. So I entered the Metropolitan Opera National Council Competition, and won! And then two weeks after I graduated, I joined their Young Artist Program. I didn’t understand what was going on; I had just turned 22. It all happened really fast! I was excited because I wanted the best (whatever that was), because that would make me more confident and sure of myself. When I had entered the competition, I had been singing opera for maybe a year. And afterward, I began getting these phone calls from Italy asking, “Can you come here and sing Figaro in Barber?” And I was like, “I’m a bass-baritone, I can’t sing the Barber of Seville, what are you talking about? !” And then I thought, “Wow, wait a minute, maybe this competition was more important than I thought.” And of course, it was. It changed my life. I went to the Met for three and a half years as a young artist, and I just finished on July 31 of this year. I was in five operas at the Met last year, then I went to Fort Worth Opera for Julius Caesar, and then I came here for Porgy and Bess. 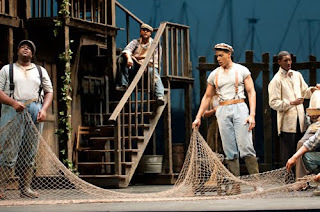 John Christopher Adams (Nelson) and Donovan Singletary (Jake) in Seattle Opera's production of Porgy and Bess. Why did you decide to make that transition from pop music to opera? I still remember, I was at a family reunion and we were playing volleyball, and I was singing some Stevie Wonder song, and my aunt said, “You know, you should go on Showtime at the Apollo, you have a really nice voice.” I was really young at that point, and she planted that seed. From that moment on, I was singing all the time. And I started entering pop competitions and started winning them in high school, and I joined my church choir. I was the kind of singer that could croon and do a few runs, and I was loud. I was in two pop groups that I formed. And then I went to college, which I had planned on attending for only two years, to get some foundation before leaving to pursue a pop music career. But then I started winning these opera competitions and moving in that direction and I thought maybe I should test that for a while. And after a year or so, I realized that maybe this is the type of music I was supposed to be doing. When my choir director from home first suggested it, I was like, “Opera?! What are you talking about?” But that’s why you never say never. Let’s talk about Zuniga, your character in Carmen. In this role, you don’t have to sing too much—but you do have a lot of dialogue. Has that dialogue been challenging for you? This is the first show where I’ve done spoken dialogue like this, so at first I was really nervous. I was worried that the flow wouldn’t be right, because recitative and spoken dialogue are completely different. I’ve done plenty of recitative, but for dialogue you really have to understand what the characters are saying if you want it to feel authentic. Yes, there’s not a lot of singing in my role, and at first I was slightly disappointed—but then I realized this would give me some time to prepare for some other things, too. Like, perhaps, the role of Escamillo? [Laughs] No, I haven’t worked on that much. I’ve been singing the Toreador song for years—I love it—but as for the rest of the role, no, I haven’t worked on it. If something comes up and someone says, “We want you to sing Escamillo in a year or two,” of course I’ll jump into it! 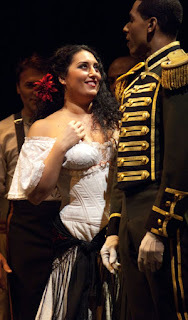 Anita Rachvelishvili (Carmen) and Donovan Singletary (Zuniga) in Seattle Opera's current production of Carmen. How big a role does the director—in this case, Bernard Uzan—have when it comes to finessing that dialogue? What about the conductor? I think that having a good handle on a language is first, in order to make the dialogue easier. I studied French in Paris, at La Sorbonne, so I was excited and nervous to do this. But yes, the director plays a huge part because, though I have coaches that I work on my language with, the director is the one who determines how the lines will be delivered. For example, I had certain breaks and pauses and breaths that Bernard didn’t agree with. Since he speaks French, he has really helped me make it as authentic as I can. As for the conductor, he isn’t involved as much, unless there is music involved with that piece of dialogue. 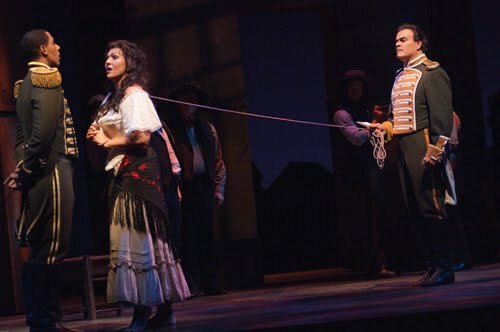 Donovan Singletary (Zuniga), Malgorzata Walewska (Carmen), and Fernando de la Mora (Don José) in Seattle Opera's current production of Carmen. 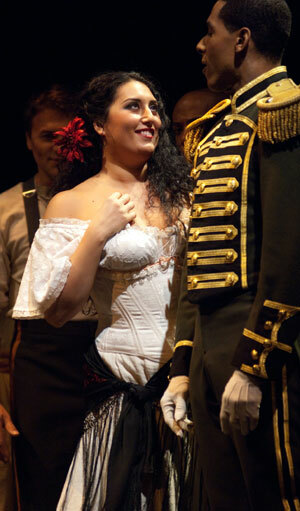 Who is your favorite character in Carmen? My character! [Laughs] No, of course it’s Carmen. Both of our Carmens [Anita Rachvelishvili and Malgorzata Walewska] are really great. I’ve seen the show a million times, at the Met and other places, but being in the rehearsals and watching the process of the show being put together is so interesting. I never before realized how evil Carmen is. Well, OK, not evil--but she’s very calculating, like a predator. She’s this beautiful gypsy, who, if you get the right person to play her, is a mesmerizing character people are enthralled with. And even though she does so many questionable things, you feel bad for her in the end. She’s basically so free with her love that she’ll offer it to all these guys and tease them and take it away. And then the one guy who really falls for her? She ruins his life! She makes him reject someone who is truly in love with him (Micaëla), she makes him abandon the army, and then he joins a gang! She ruins his life. This character is very interesting to me, and I love the way that both Anita and Malgorzata play it.